In 1804, the followers of the Separatist George Rapp (1757-1847) emigrated to America from Iptingen (near Stuttgart) in southwest Germany seeking religious and economic freedom. Nearly 800 farmers and craftsmen followed their leader to Butler County, Pennsylvania where they built the town of Harmony. Ten years later they migrated westward to Posey County, Indiana founding a second town named Harmony, which today is known as New Harmony. In 1824, the Harmony Society returned to Pennsylvania, this time settling in Beaver County along the Ohio River. There they founded “Oekonomie,” now better known as Old Economy Village. It was here that the Society gained worldwide recognition for its religious devotion and economic prosperity. The Harmonists developed a simple, pietistic lifestyle based upon the early Christian Church. They turned over everything they owned to the Harmony Society when they became members. Everyone worked together for the good of the Society and received, in turn, what he or she needed to live simply and comfortably. Because they expected Christ’s Second Coming to Earth at any moment, they adopted celibacy in 1807 in order to purify themselves for the Millenium – Christ’s 1,000 year reign on Earth. The Harmony Society successfully “placed the manufacturer beside the agriculturalist,” an accomplishment held in high regard in the early nineteenth century. National leaders like Thomas Jefferson viewed this as the ideal plan for America’s economic and political future. This ideal would be a national economy that would thrive in both agriculture and industry, independent of foreign influence. The Harmonists created, adapted, and adopted the new technologies of their day giving them a competitive edge in the growing early American economy, particularly in textile manufacturing—wool, cotton, and silk—and agricultural production. By 1825 they had constructed textile factories powered and heated by steam engines. They built shops for blacksmiths, tanners, hatters, wagon makers, cabinetmakers and turners, linen weavers, potters, and tin smiths, as well as developing a centralized steam laundry and a centralized dairy for the community. Later, they perfected the technology of silk manufacturing, from worm to fabric, for which they received gold medals during exhibition competitions in Boston, New York, and Philadelphia Despite the Society’s economic success, time and events brought about its decline. In 1832, one third of the members left Economy under the leadership of Count de Leon, a self-proclaimed prophet. In 1847 Father Rapp died. Although the Harmonists leaders turned to new business ventures – railroads, oil production, and building Beaver Falls and its industrial complex – their economic vitality, like their membership, eventually waned. By the end of the nineteenth century only a few Harmonists remained. In 1905 the Society was dissolved and its vast real estate holdings sold, much of it to the American Bridge Company who subsequently enlarged the town and renamed it Ambridge. Six acres of the Society’s original holdings, along with seventeen buildings, were acquired by the Commonwealth of Pennsylvania in 1916. Today, these six-acres, surrounded by Ambridge’s National Register Historic District, are administered by the Pennsylvania Historical and Museum Commission as a National Historic Landmark site. 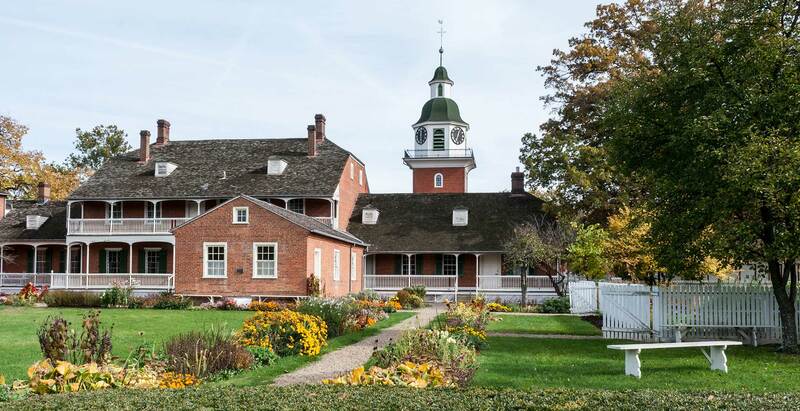 The historic site, which contains the seventeen restored historic structures and garden built between 1824 and 1830, originally was the religious and economic hub of the Harmony Society. The buildings, grounds, library, archives and 16,000 original artifacts are a memorial to the Society’s commitment to the religious discipline and economic industry that built their American Utopia.